As a Union leader, Fernandes organised railway strikes and later become railway ministry; despite a socialist idealogy became industry minister; allied with BJP despite distrust for RSS. NEW DELHI: As a young man training to become a Catholic priest, he found it offensive that rectors at his seminary got better food than the students. 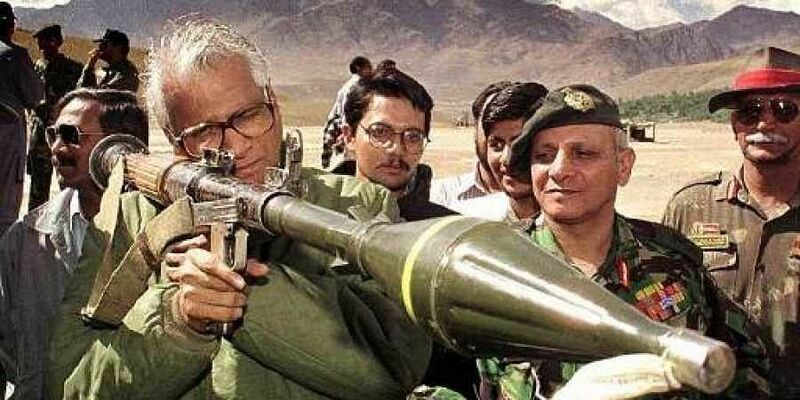 This desire to fight for justice became the defining quality of George Fernandes, one of India's most firebrand union leaders who remained a socialist activist even in his several stints as Union minister. Fernandes epitomised irony -- as union leader he organised India's biggest railway strikes and later became railway minister; despite his socialist ideology, he became industry minister; harbouring a deep distrust for the RSS he allied with the BJP. All his life he had a reputation for incorruptibility, yet he had to resign as defence minister over an oblique corruption charge against his close aide. Born in Mangalore, Karnataka to a Christian family on June 3, 1930, Fernandes was truly a pan-Indian leader who rose above identity politics -- he left the seminary at 19, went on to become a union leader in Mumbai, was a member of Parliament from South Bombay and for many terms MP from Muzzafarpur and Nalanda in Bihar, and spoke English, Hindi, Kannada, Konkani and Marathi fluently. "We have lost a leader who was a fighter and dedicated his life to the cause of workers, labourers and common people of India," said NCP president Sharad Pawar, who shared a deep personal bond with Fernandes despite their political differences. Fernandes is best remembered as the union leader who led the famous all-India railways strike in 1974 that brought the country to a standstill. As industry minister he forced Coca-Cola and IBM to leave India in 1977 and as defence minister he oversaw the Kargil war in 1999 and the Pokharan nuclear test in 1998. Usually dressed in a crumpled kurta pajama and slippers, the unpretentious Fernandes made no attempt to change his attire even while holding high offices. He had a deep empathy for soldiers, and as defence minister visited Siachen more than 30 times, often taking cake to distribute among jawans during Christmas. Fernandes also changed the defence narrative, shifting focus from Pakistan as the traditional enemy, when he described China as India's "Enemy No.1". He was also the only defence minister to have fired a serving Navy chief, using a stringent Constitutional provision that provides no room for inquiry. He fired Adm Vishnu Bhagwat in December 1998 after he publicly opposed a Cabinet decision to appoint Vice Adm.
Harinder Singh as the deputy Navy chief. He was a staunch anti-Congress leader and emerged as a key figure in the fight to restore democracy after then Prime Minister Indira Gandhi imposed Emergency in 1975. His underground crusade against the Emergency catapulted him among the leading opposition figures. A photograph of Fernandes, with his shock of unkempt hair, raising a manacled hand in defiance remains one of the most enduring images of those times. "His unimpeachable commitment to democracy and willingness to go to any length to propagate his cause was an inspiration to him and many others during the Emergency," said Union minister Ram Vilas Paswan, Fernandes' colleague for years. After Mrs.Gandhi called elections in 1977, Fernandes won elections from Muzzafarpur with a massive margin while still lodged in jail for his role in what is known as the Baroda Dynamite case. The Congress lost the elections, and Fernandes was released. He became industries minister in the Janata Party-led government, and promptly butted heads with Coca-Cola and IBM, requiring them to own not more than 40 per cent of share in their Indian enterprises. Rather than oblige they wound up operations and left India. During his time in the centrist coalition government, he had an uneasy relationship with some of the constituents including the BJP because of its Hindu ideology and its association with RSS. Yet, it was his tie-up with the BJP in mid 1990s that was crucial in ending the saffron party's isolation in alliance politics as many 'secular' parties followed his cue and propelled it to power twice under Atal Bihari Vajpayee's leadership when he became defence minister. Many saw these manoeuvres as political opportunism. "Surivival has always been George Fernandes' first priority, not ideals not ideology, as he often makes it out to be," said Janardhan Thakur, a political commentator in "Faces: Forty in the Fray," a book of profiles of 40 politicians. Fernandes' clean reputation was ironically marred by only one blemish when close aide Jaya Jaitly was accused of facilitating payment of bribe by defence middlemen, who in fact were undercover reporters for Tehelka magazine. Following the scandal, he was forced to resign as defence minister. Fernandes entered electoral politics with a bang after he, as the Samyukta Socialist Party candidate, defeated seasoned Congress leader S K Patil in Bombay South constituency in 1967. It is believed that he also played a key role in bringing Nitish Kumar, who like Fernandes had begun drifting away from Lalu Prasad, then Bihar chief minister, to the BJP-led alliance after the 1995 assembly polls in the state. His personal life was not without controversy. Jaitly, his colleague in the Samata Party, moved in with him while his wife Leila Kabir Fernandes and son were in the United States. They alleged that Fernandes' brothers had colluded with Jaitly to grab his property and political legacy. The allegations ended up in court, which ruled in favour of the wife and son, who took custody of Fernandes who by then was afflicted by Alzheimer's disease. The debilitating disease left him with no ability to understand what was happening around him. For close to a decade he faded from public memory as his family members cared for him at home in New Delhi's upscale Panchsheel Park. "Fernandes was a fearless leader and always full of energy. He had that restlessness to do something for people. And he did politics for the people," Jaitly told PTI. But his political career had ended earlier when he fought a lonely battle as independent from Muzaffarpur in the 2009 Lok Sabha polls after his party JD(U) denied him a ticket as Alzheimer's hit him. This time, his constituency rejected him, yet he returned to Parliament as Rajya Sabha member. A year later he was out of the upper house also, never to return to active politics.